In the RMXP editor, the first layer represents the floor, the second layer the walls and the third layer the ceiling. A FPLE tileset has three lines of 8 tiles, and each line must have a corresponding file of textures. The first line of the tileset is used for the floor, the second line for walls, and the third for the ceiling. The three files of textures that you have to create must be named tileset_name_Ground, tileset_name_Wall and tileset_name_Ceiling (height = 8 * width). The three must have the same dimensions per tileset. 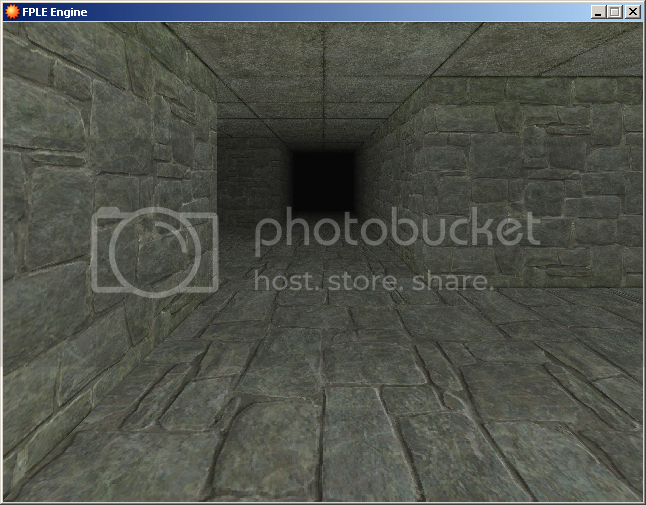 You can obtain the maximal quality by using 640 * 5120px files (in the demo the textures have a width of 480px). To activate FPLE mode for a map, add [FPLE] to its name. Events chraracters are displayed vertically (like walls), centered and always facing the player by default. "Type 1" : in the RMXP editor's view, the character surface is horizontal. So if the player's direction is up or down in the absolute frame of reference, the surface will be facing the player, and if the direction is left or right, the surface will be rendered like a "side" wall. "Type 2" : in the RMXP editor's view, the character surface is vertical. "Stretch" : the picture is stretched to fit a wall's dimensions. This option is set by default if the dimensions of the picture to display are too big. "V-Align 0" : vertical alignment : top (only if not stretched). "V-Align 1" : vertical alignment : center - default value (only if not stretched). "V-Align 2" : vertical alignment : down (only if not stretched). 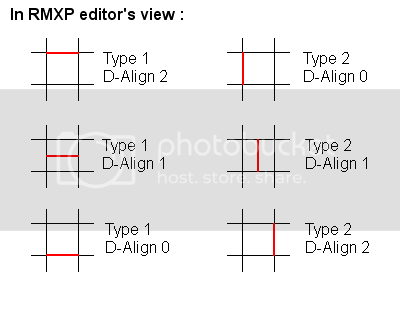 "D-Align 0", "D-Align 1", "D-Align 2" : depth alignment, only for types 1 and 2, see diagram below. The resolution affects the quality of the rendering only during movements. You can adjust the value in the Game_System class (fple_resolution). Surfaces are rendered within a fixed distance, arbitrarily defaulted to 6 squares. Use lower values to increase performances. To prevent surfaces popping, a "light" distance specify in how much squares the opacity of surfaces will be null. This fading works with OPACITY : without panorama, as the background is black, surfaces will be darker and darker with the distance. I did not expect the map itself to perform as well as it did. Fluid motion, not like the herky jerky pseudo 3D of some old 3D maze roamer games. The option to go back and forth between 3d and standard XP style is a definite bonus. I think it would allow for new classic Phantasy Star 1 style games to be created with a bit of effort and talent.